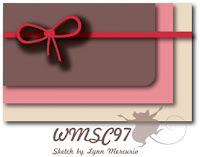 It's been a long time since I played along with the Waltzingmouse Sketch Challenge...so...I've remedied that by using this week's fun sketch by Lynn Mercurio for this shabby chic card. Edges were all distressed and sponged with Antique Linen distress ink. What else did I use? ACCESSORIES: Lace and bling borders by Prima Marketing, Rose Red seam binding (SU), Pearl brad, Distressing tool. The weatherman just reported we got 5 inches rain in the past 24 hours and it's still coming down! I'm thinking I should take up watercoloring - lol! This is beautiful Wanda. I love how your bling crawls up the pate to your bow. Amazing papers too. Absolutely stunning. love your mix of papers!! a great take on the sketch! So elegant, Wanda! This will really make someone's day! Gorgeous patterned paper and pearl flourish! So girly, love it all! SO beautiful, love the bling and fabulous roses! Love that pretty rose paper Wanda - the lace, pearls and nice distressing! Such a beautiful card - I do like the soft colours and pretty papers. Love the ribbon and lace too! Absolutely beautiful!! Love every thing about it. A beautiful card, Wanda! Gorgeous bow and papers and I love the distressed edges. Congrats on getting the Top Mouse award!! Guess I missed this one...gorgeous!! Love those papers!!! And.. Big ole' bows always make me smile, along with bling! Hope things are going well!!! Congrats on getting Top Mouse with this beauty! So well deserved, its just gorgeous!